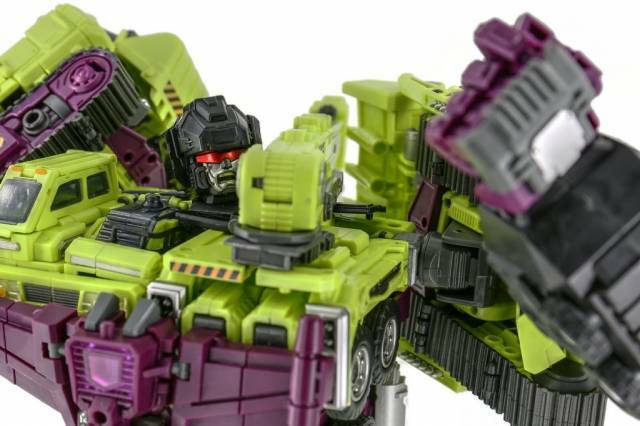 Enter Gravity Builder, the massive combiner by Generation Toys! When fully combined Gravity Builder stands roughly 38 CM/15 inches tall. This set includes all 6 figures! 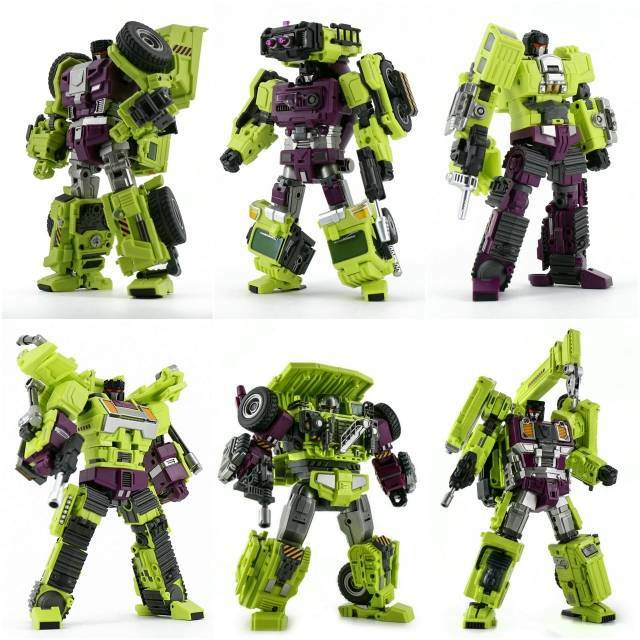 With the exception of GT-01F, the other 5 figures are all able to transform between all three modes without detaching any parts. Does not include Megasorry or Tyrant bonus figures. "Excellent "build" quality. (See what I did there?)" So glad I ordered this when I did! Fast delivery, professional packaging, what more could you want? The figures themselves are buillt very solidly. The transformations each character has is very unique to each one. 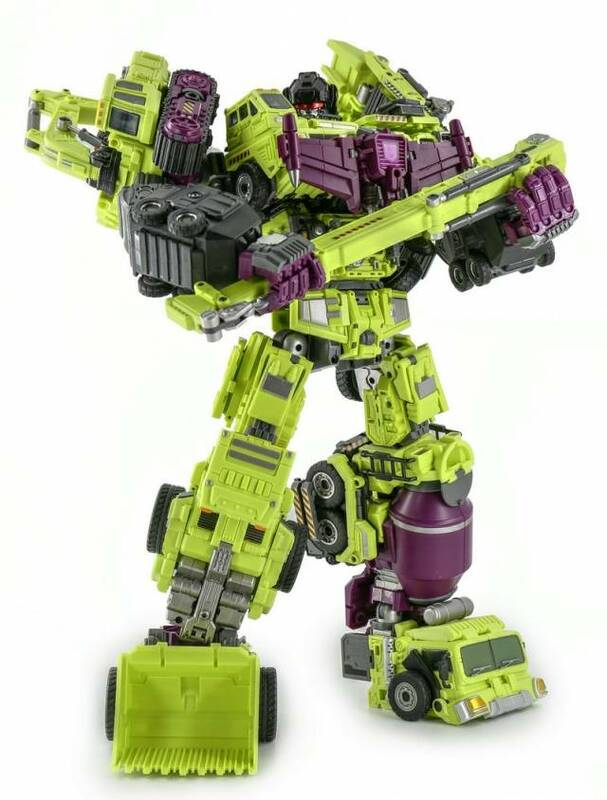 Once combined (after some very difficult prying of the connectors on each figure) gravity builder (devastator) is very poseable, has a great stylised design, and even has spots for decpticon emblems. Each figure looks great in vehicle, and robot modes; which is hard to accomplish once, let alone in all 6 figures. Thanks so much tfsource! "He will make an impression in your collect." Did not think I would love this figure as much as I do. The individual bots are nicely crafted and have many of small details that you notice when you get up close to them. But my favorite parts are the are solid where they need to be and bulky where you want them. Transforming them between vehicle and bot is easy. The joints are strong and I didn’t feel any stress on any of them when transforming them. Weapons blend nicely into vehicle mode. But where this guy shines are when all six come together. 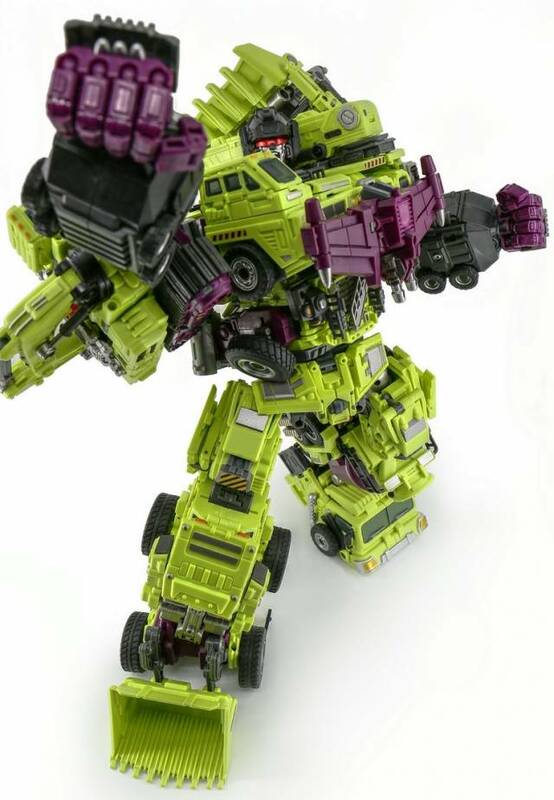 They size, mass, pose ability, and details on this guy are amazingly wonderful. He has a presence in your collection I’ve only see with a few other figures. The figures do come with some replacement parts and I didn’t find I needed them at all. I did try putting some in and they are a pain. Springs with pressure gears on them, ugh. Would not recommend trying to replace joints unless you need to. It does come with some replacement heads for certain figures which are nice and I did use. Easy to swap out. Overall, I could not be happier with this guy. "outstanding piece of engineering and quality. THE only devastator you should invest in." Generation toy put the time in and it paid off. What a beauty. I absolutely love this toy and he has fast become one of my favorites. LIke most collectors i was torn between this and toyworlds...so i simply purchased both. Toyworlds devy was sold on ebay about a month after i had completed this guy....there was simply no comparison. Do not hesitate, take my wisdom and experience and buy a toy from a company that doesn't have a history of poor quality, breakages, and extreme panels and parts forming. 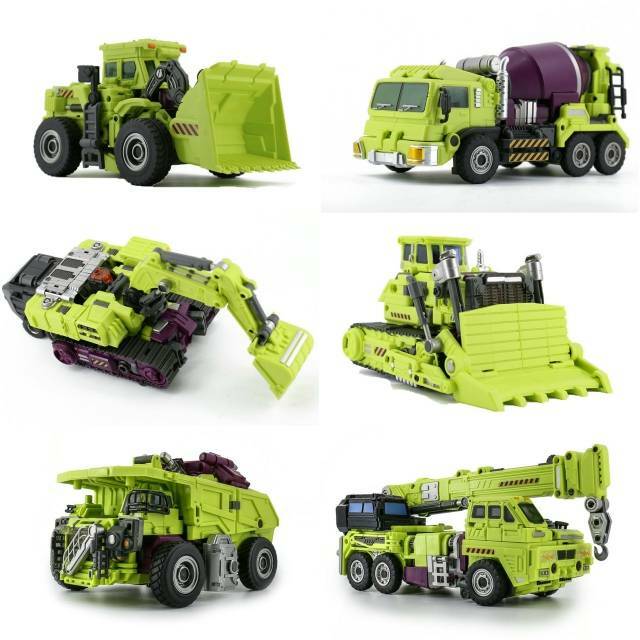 Generation toy has quickly rose to one of the top quality third party transformer companies and toyworld still remains near the bottom, and their devy is not different. The vehicles are outstanding and the way the parts forming that does exist works with the rest of the design is absolutely perfect. this was well thought out before release vs just being shoved out there like toyworlds designs. 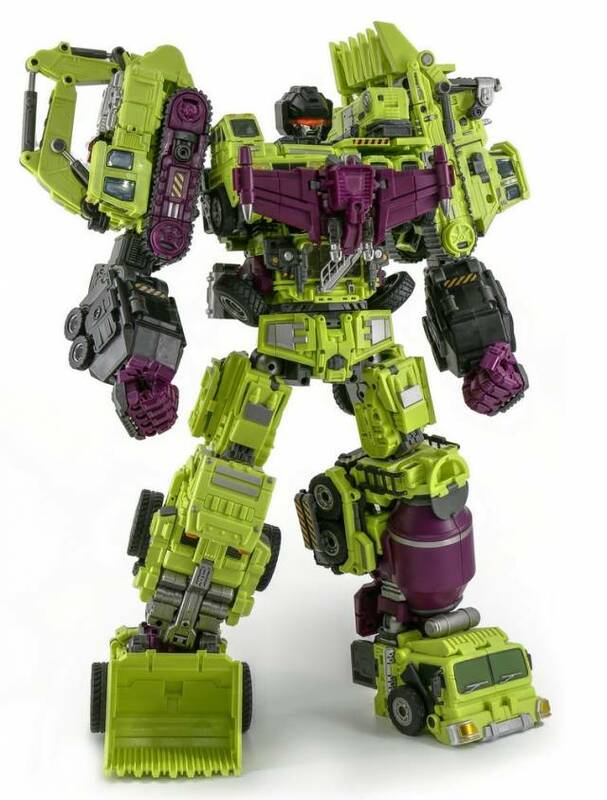 Beautiful toy...from vehicle, to robot, to combiner...especially combiner..he is utterly the devastator i have waited for. "Fantastic, if I could give it more the 5 stars I would." I watched just about every review I could before purchasing this toy, and it was well worth the investment. There is very little wrong with this set and even then it’s a lot of personal complaints. I am looking forward to there next release.